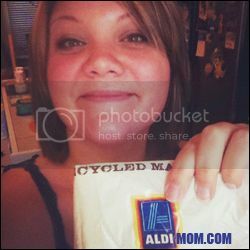 One of our group members has a few things she would like to shout out to the public about some of her favorite Aldi items! We have been using aldi's condensed and cream soups for 4 yrs now and they are by far superior in quality to even the leading brand, they have more chicken pieces and noodles per can and without the chicken skin you see in some brands. Also the flavor top's all other store brands and my children prefer it over the leading brand and request the aldi's brand because of the heartiness. Aldi's brand is hormone free which I prefer as a parent. there milk taste fresh and has a long shelf life. Being big milk drinkers we go through a gallon a day and my husband and children all prefer the taste of Aldi's milk to any other brand, we have tried the whole, 2%, skim, chocolate and butter milk for baking all are wonderful. We actually make a hour drive weekly to aldi's for the milk and refuse to buy milk anywhere else. They offer a clean long grain rice that is comparable to top brands at a fraction of the price. Unlike a lot of store brands the bag is not full of remminets and broken grains. It cooks well and is flavorful without getting sticky! If you want to contribute, click here! I am so sad that they discontinued the Lacura cosmetics in the US. They are still carrying them in Europe. I believe they are still carrying the cleanser though, and it's very high quality. Better than most drugstore brands and a few department store brands! Also, I prefer ALDI's cream puffs to any other brand. And the Grandessa Alfredo Sauce.